The borders had all gone too easily up to now and we’d been beginning to think that the issues with borders might be all hype. Well this border proved us wrong. It took us 4.5 hours to get across both borders and into El Salvador and that was using Tramitadores (these are border crossing facilitators with a reputation for trying to rip you off) for help. 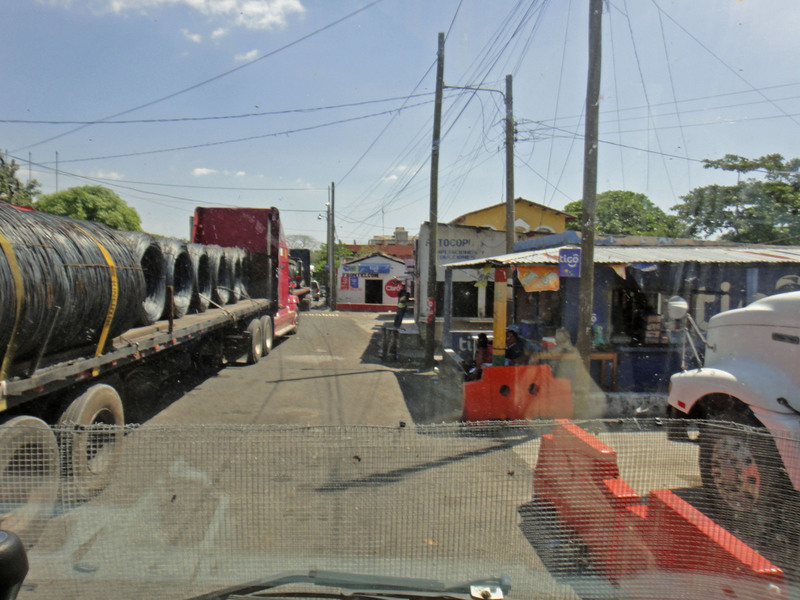 On arrival at the Guatemalan side of the border the first thing you encounter is an enormous line of trucks completely blocking your side of the highway. We already knew that you shouldn’t line up with the trucks so we started playing chicken down the wrong side of the highway. Everytime a truck came the other way we managed to tuck in somewhere and then make another 100m dash up the line before the next vehicle came our way. Eventually we managed to enter the line about 5 trucks back from the border buildings. While playing this hopscotch we had a tramitador jump on the side of the truck and tell us that his help was necessary to survive the border process. We initially told him we didn’t need any help but fortunately he ignored us and proceeded to help us anyway. We agreed a fee of USD5 for his help at the Guatemalan border. One of the key things if you employ a tramitador is don’t let them run off with your original paperwork and also make all the payments (and get a receipt) yourself. The first thing that happens at the border is that you get your Vehicle import document stamped by an official at the side of the road. You then need to find somewhere to park that isn’t too in the way to do the rest of the processes. The first of these is to take your passports to the immigration office. It only needs one person to do both passports. 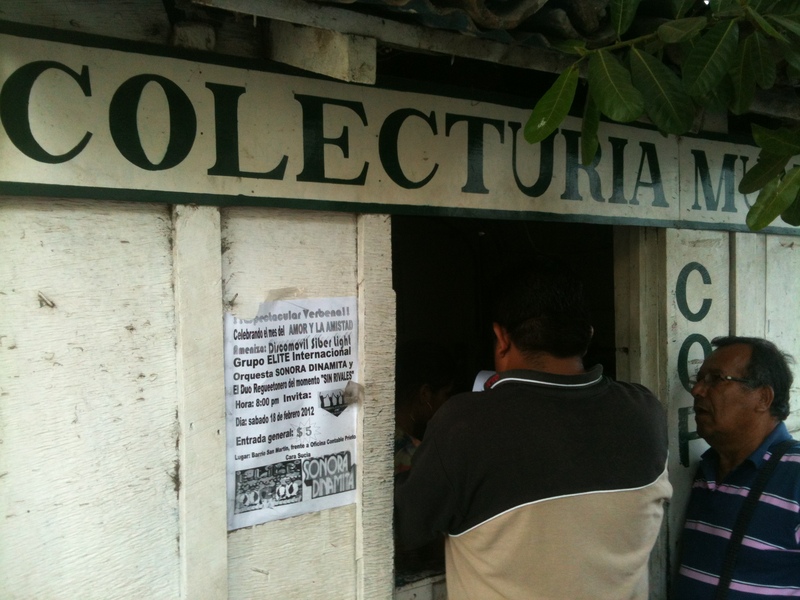 This is where our Tramitador started earning his money. There was a long queue at the exit side of immigration so he took me to the entry side and got our passports stamped there. The next thing after this is to visit one of the photocopy places that are across the road from the border post. The photocopies are all about the vehicle export. You need 2 copies of your passport photo page plus the entry and exit stamps from Guatemala. Also you need 2 driving licence copies and a copy of the Temporary Import document with the stamp that you got at the start of the process. You also need 2 copies of your vehicle registration. These copies are then put into two packs one with the original Import document and one with the copy. Next stop is to go to Aduana. 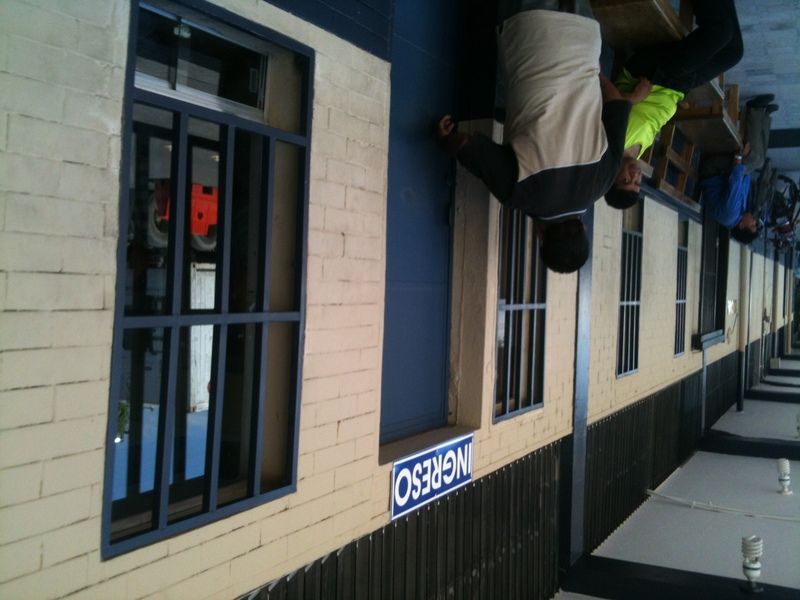 This is an unmarked office (well the door has a sign above it saying “Ingreso”) on the incoming side of the border. I’m not sure I would have found this without help. There is a security guard inside the door and you register your details with him and he will give you a piece of card with a number. You are now in a queue waiting for a customs agent – along with a whole load of truckers! Now I’m sure that someone somewhere was communicating numbers and that the queue was moving but I didn’t hear anything! After waiting for about 40 minutes it was our turn. The customs guy took our paperwork and then we had to run around to the truck so he could check the VIN number against the plate in the door frame of the truck. Then we were back inside where he tapped away at a computer and then we were done. You then have to drive forward – hand a guard the original of the Import document and then there is a 2km long queue of traffic to negotiate between the Guatemalan side of the border and the El Salvadorian. This is nose to tail trucks and there was no room for us to skirt up the sides. Keep alert though because cars can weave in and out and if you let the gap with the truck in front get big enough someone will pounce! 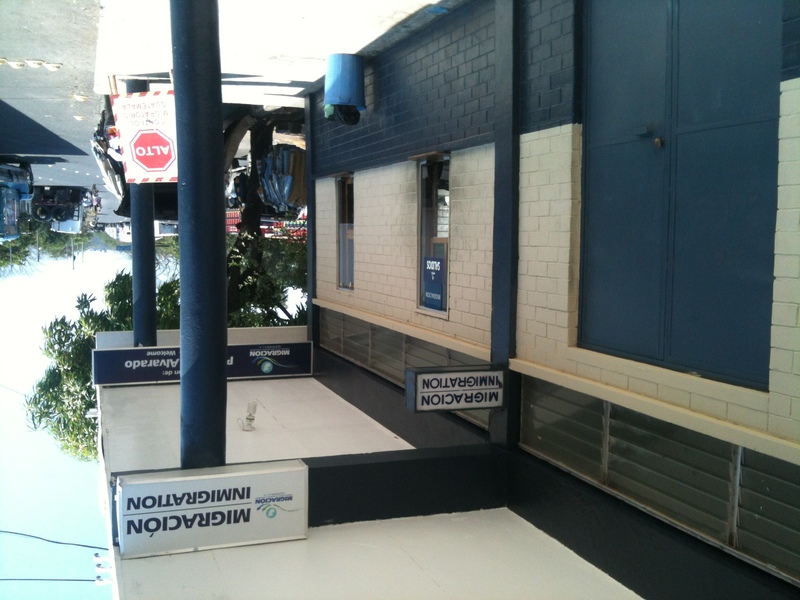 When you finally reach the El Salvador side of the border you will reach a fork in the road – one way is light traffic and the other heavy – take the light traffic route. You arrive at a large building on your right and there should be space to park right outside. Our tramitador had accompanied us to this side for another USD5. While we needed him on the Guatemala side he was not so necessary on this side. Although for USD5 he did make life easier. 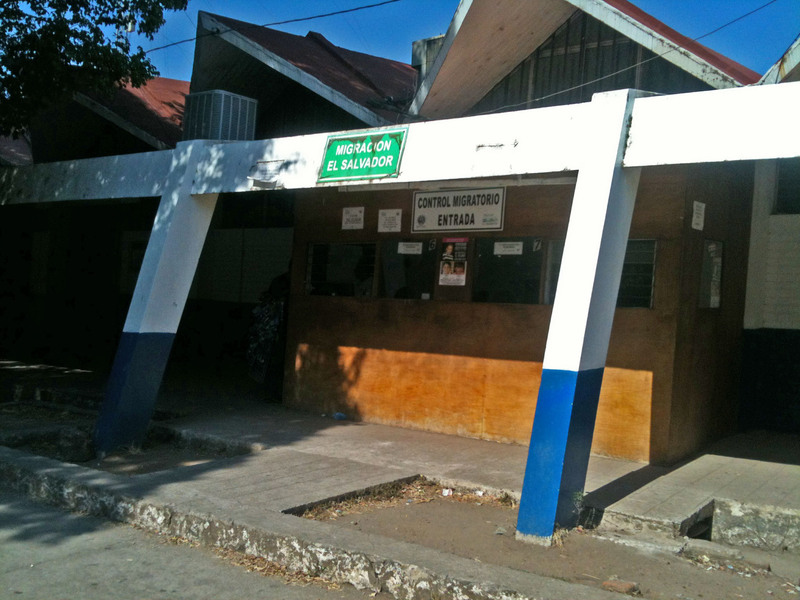 First stop is the immigration window which is a small hut at the near end of the building. It was a matter of minutes to have both our passports stamped. 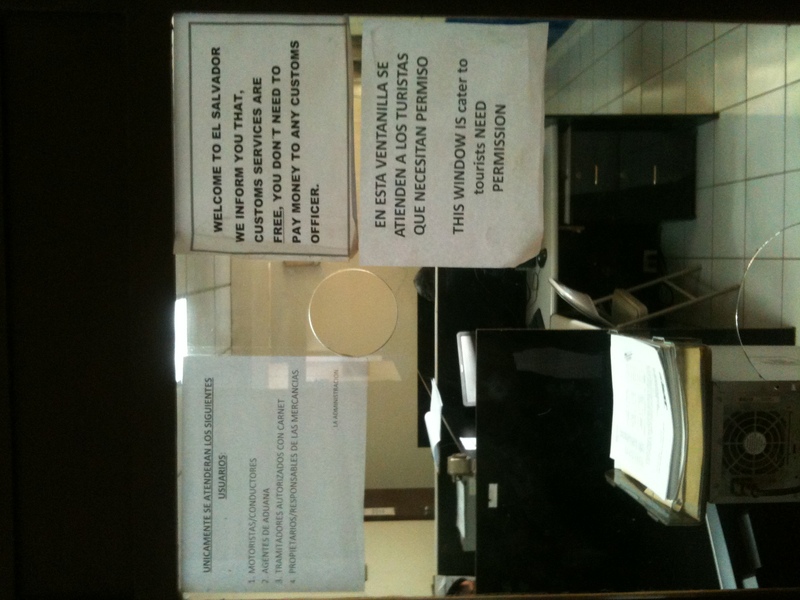 Then I had to take my passport, Vehicle registration document and stamped copy of the Guatemalan import document to the Aduana office. I then proceeded to wait at the window for a clerk to process my import for over an hour. There were people in the office and no-one was inclined to help. Your tramitador cannot help at this point as he isn’t allowed in the building. When someone finally came over he very irritatedly motioned for my documents and then went back to his desk. After a few minutes he swept out of the office without a word. Fortunately a trucker in the building told me that I had to go with him! Outside he checked the VIN number of the truck and noted down a few things like how many doors it has and that it is diesel. Then handed me a form to go and get photocopied. There is a Photocopy place opposite customs in the same building but no one was there. My tramitador jogged off with me in tow down the road to a small shack with a photocopier in it. The copies were done and no money changed hands. After this it was back to customs. I was feeling more pushy this time so I waited until the door to the office opened and then stuck my head through and handed the guy who had been dealing with me the docs. He did some processing then handed everything to a second guy who beckoned me to his window. This guy checked everything the first guy had done while chatting to me in quite good English – although he wanted to talk about “my prime minister – Margaret Thatcher”! When he was done he handed me the Temporary import form for El Salvador. When this guy was done we were nearly there. Just needed one copy of Temporary Import Permit and then we were good to go. 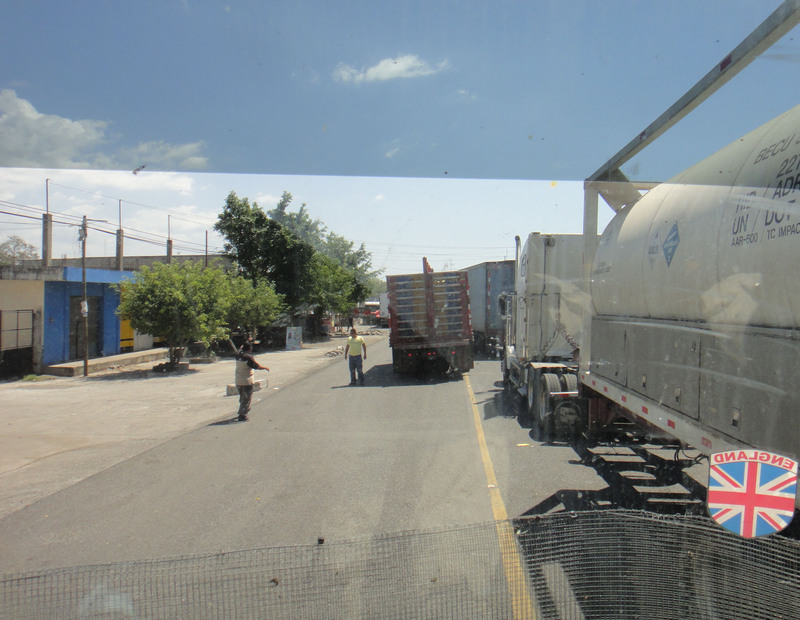 This is when our tramitador tried to stiff us by offering to bribe the guard at the border gate to let us through in front of the trucks – he wanted USD20 for the privilege. We declined and drove to the gate where there were no trucks in the way. We handed the copy of our import form to the guard there and we were finally good to go. 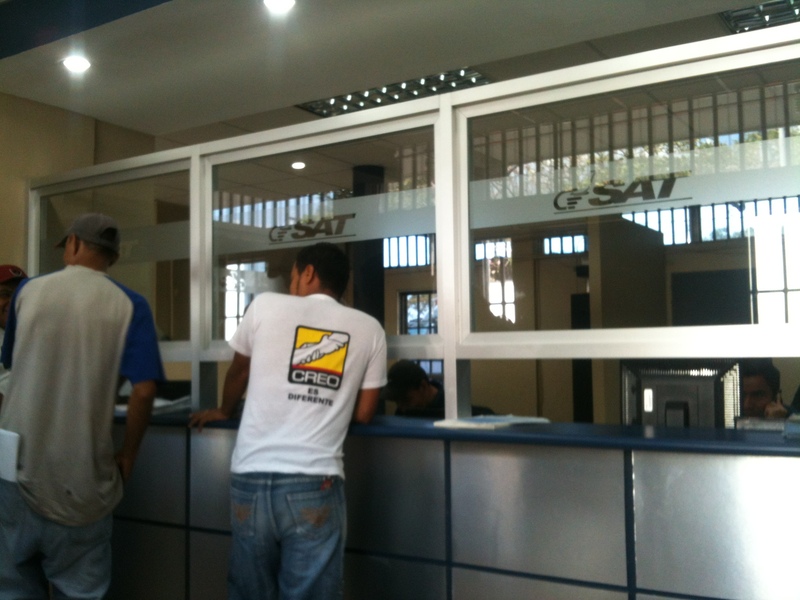 However we did have to pay USD5 for a contribution to the upkeep of the roads in El Salvador – we got a receipt though so I think it was legit. There was no requirement for fumigation. All of this was in 40c heat and we were feeling fairly frazzled. We drove only a few miles before finding a petrol station where we could park for the night and relax ! One of the other crossings (Las Chinasmas) may be a better bet as commercial vehicles are banned from this crossing. We went to this one though because it meant less mileage for us. I like the bit about chatting about the prime minister – at last someone has clocked that actually Cameron and Thatcher are one and the same! Sounds like you are having a lot of fun!!!! Lots of fun – I could do without the border crossings though. I thought you were too busy to read blogs – Irfan tells me you’re stressed with your door shut ! Well written up, and well handled! The “helpers” are pretty much the same the world over, And sometimes you get the $5 entertainment by watching them trying to make their services look important. Did you receive any grief for crossing the border for your RHD truck? Was the import permit limited to a day or two or something longer? We know folks with a RHD who had 7 hours to transit – but only after some serious negiotiations. I’ve heard that’s true. Our truck is LHD though – we moved the side before we left (advantage of an army truck). Good luck – I hear it depends on the border and pot luck !